Temperatures are starting to fall a little here in my area of Texas. I'm surprised, to be honest, and half expect summer to make another appearance before it's all said and done. Meanwhile, I'm enjoying the cool temps in the morning. It's making me look forward to cozy shirts, the smell of cinnamon in the air, and pumpkin spice cake. 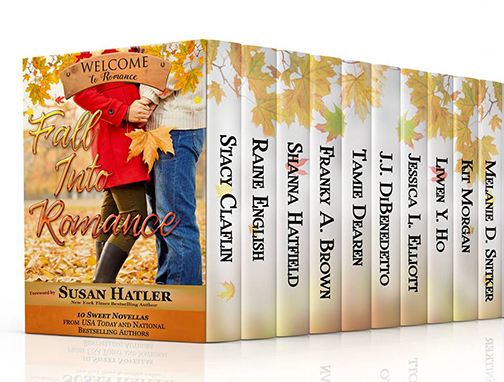 Another reason I'm excited for fall this year is the release of Fall Into Romance, a collection of ten novellas. It's been an honor to work with fellow Sweet Romance Reads authors Shanna Hatfield, Raine English, and Liwen Y. Ho, and six other wonderful authors to put together a boxed set that's guaranteed to make you smile. Available for Pre-order For Only $0.99! 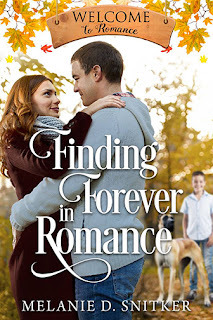 My novella, Finding Forever in Romance, was a blast to write! Between the sweet romance, a little boy with a lot of character, and cuddly animals that made me want to adopt them myself, it's my hope that you'll come away from reading this novella with a smile on your face. Join us on Facebook as we celebrate the release of Fall Into Romance. There'll be games, prizes, giveaways, and so much more. Trust me, you won't want to miss it! I'm not a huge fan of pumpkin pie, but I absolutely love pumpkin bars. I rarely make them except for during the fall season, and I'm looking forward to making them again soon. Here's the recipe in case you'd like to try them yourself. Bake at 350'F for 25-30 minutes. Test with a toothpick to see if it's done. Cream the cheese and butter, stir in vanilla and sugar a little at a time. Mix until smooth. Spread the frosting over the pumpkin cake and enjoy! 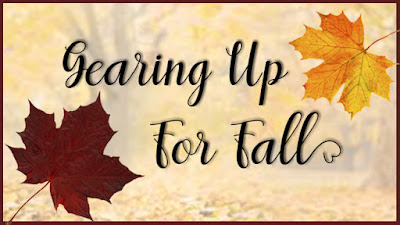 What's your favorite fall-inspired food or treat? Feel free to share a recipe! Looking forward to reading this wonderful boxed set, Melanie, by some of my favorite authors. Thanks for the recipe, also! Melanie, the collection sounds terrific and the recipe does as well. Thanks for sharing. Thanks, Mary! I'm looking forward to making it again. Cook wild rice according to directions. You will cook 1 cup of rice to gain 2 cups of cooked rice. This takes about an hour or a little longer. In med fry pan cook chicken pieces until juices run clear. While chicken cooks, slice up carrots and celery and dice onion. Add to a large pot and add chicken broth. Cook until cooked tender. Add the butter and flour to the pan you cooked the chicken in and form a roux. add half and half to this and let thicken a bit. Add this mixture to the pot of veggies and then add the chicken and wild rice. at this point add the sliced fresh mushrooms and let simmer for about 20 minutes stirring occasionally. seasoning as desired with salt and pepper. Serve with crumbled cooked bacon and sliced green onions or croutons if desired. I forgot to say I am excited to read this. I loved boxed sets! Your pumpkin bars sound very good! Thanks for sharing. The recipe sounds great and I love soup in the fall and winter. Yum! Yummy recipe, Melanie and the boxed set looks great! The pumpkin bars sound delicious! Going to have to try them! Thanks, Melanie! You're welcome, Shanna! I'm hoping to make them soon. I've been craving them for a while!